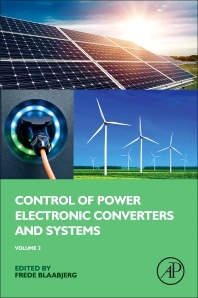 Control of Power Electronic Converters, Volume Two gives the theory behind power electronic converter control and discusses the operation, modelling and control of basic converters. The main components of power electronics systems that produce a desired effect (energy conversion, robot motion, etc.) by controlling system variables (voltages and currents) are thoroughly covered. Both small (mobile phones, computer power supplies) and very large systems (trains, wind turbines, high voltage power lines) and their power ranges, from the Watt to the Gigawatt, are presented and explored. Users will find a focused resource on how to apply innovative control techniques for power converters and drives. Frede Blaabjerg was with ABB‐Scandia, Randers, Denmark, from 1987 to 1988. From 1988 to 1992, he was a Ph.D. Student with Aalborg University, Aalborg, Denmark. He became an Assistant Professor in 1992, Associate Professor in 1996, and Full Professor of power electronics and drives in 1998. His current research interests include power electronics and its applications such as in wind turbines, PV systems, reliability, harmonics and adjustable speed drives. He has received 17 IEEE Prize Paper Awards, the IEEE PELS Distinguished Service Award in 2009, the EPE‐PEMC Council Award in 2010, the IEEE William E. Newell Power Electronics Award 2014 and the Villum Kann Rasmussen Research Award 2014. He was an Editor‐in‐Chief of the IEEE TRANSACTIONS ON POWER ELECTRONICS from 2006 to 2012. He is nominated in 2014 and 2015 by Thomson Reuters to be among the most 250 cited researchers in Engineering in the world.